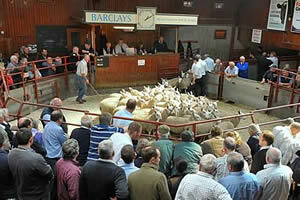 The Cumberland & Dumfriesshire Farmers Mart had forward 5,615 store lambs at their sale at Longtown on Tuesday 14th December, 2010. A large and tremendous trade with all vendors highly delighted. Top price of £78 for Texels from Heithat, others £77 Haithwaite, £74 Browtop; Beltex £76 Walton Woodhead; North Country Cheviot £74.50, £68 Bradley Farm, £65.50 Adderston Shiels; Suffolk £74 Mackside, £72, £71 Branxholmbraes; Charollais £68 Relief; Greyface £65.80 Heugh, £65.20 Broomhill, £64.20 Kilncroft; Half Bred £65.20 Adderston Shiels; Blackface £64 Lochenkit and Blacksmiths Cottage; Hill Cheviot £60.50 Twislehope, £58 Easter Alemoor, £57 Skelfhill; Swaledale £44.50 Greenleycleugh, £43.50 High Street, £41.50 Bayles. Cast rams to £91 Linton House, cast ewes to £84 Bradley with hill types to £61 Leahaugh and Bradley. Greyface ewe lambs to £90 Albierigg; Blackface £59.50 Damhead.